This yellow 1000-foot spool of fiber optic distribution cable is intended to use for long-distance indoor runs at high data transfer speeds which is necessary to power today's advanced networks and current - as well as future - infrastructure needs. 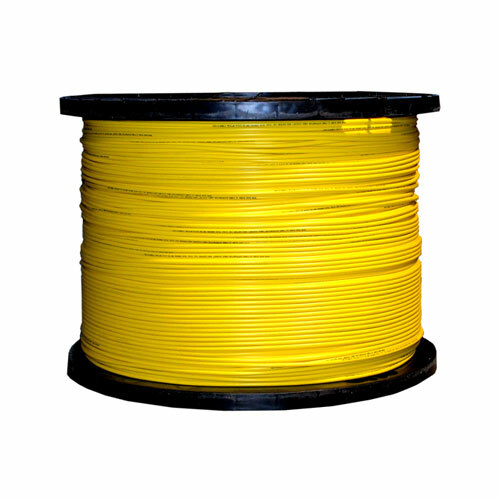 Our quality cable consists of 6 singlemode fibers (9-micron core) inside an aramid yarn wrapped in a flame-retardant yellow PVC outer jacket. This out jacket effectively allows for flexibility, as well as protects the 9 um core from environmental hazards that can damage or diminish the core's function. Single mode fiber is optimized to work with fiber optic equipment using light wave lengths of 1310nm (nanometers) or 1550nm, and has a maximum attenuation of (0.5/0.4) dB/Km. The cladding diameter is 125 microns. The core and cladding of our yellow bulk distribution fiber optic cable is constructed using a high-quality singlemode fiber that is ITU-T G.652.D compliant. It is also backwards compatible with other legacy singlemode fibers. This fiber optic cable is riser rated (CMR), meaning it complies with UL-1666. It is for usage in vertical tray applications without environmental air, including cable runs between floors through cable risers or in elevator shafts. These flame-retardant cables self-extinguish - in the event of a fire, this prevents the flame from traveling up the cable in a vertical burn test. This fiber optic cable is solidly constructed and is UL rated. The storage temperature should not be lower than -40C and no higher than +70C. Operating temperatures can safely range between -20C to +70 C.
All of the component materials contained within this fiber optic cable meet the EU RoHS and REACH Directive standards.